Steve Bruce (1995) defines a cult as a ‘loosely knit group organized around some common themes and interests but lacking any sharply defined and exclusive belief system’. Cults correspond closely to Roy Wallis’ category of ‘World Affirming New Religious Movements’. Cults tend to lack a fixed religious doctrine, and typically have very loose religious beliefs, which are open to a wide range of interpretation by members. They tend to be more individualistic than other forms of religion. Members tend to be more like ‘customers’: they are free to come and go as they please, and choose which aspects of the cult’s activities to take part in. Unlike sects, they tend to lack strict rules. There is very little commitment involved with being a member. They are tolerant of other religions beliefs. NB – The media often uses the term cult, when really it’s referring to a sect! 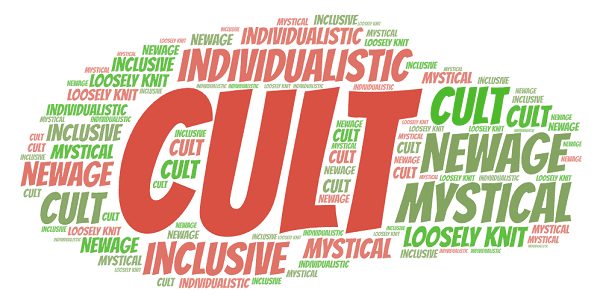 NB – when a world rejecting religious movement goes nuts and convinces its members to commit mass suicide, the media often uses the term ‘cult’ to refer to it. Strictly speaking, according to the various categories used by sociologists, such organisations are ‘sects’, not ‘cults’. Sources: Haralambos and Holborn (2013) Sociology Themes and Perspectives, edition 8.